Sony will out a new top of the line smartphone before the end of this year, and judging by its past actions that should happen during IFA in September. Just last week we heard that the 'full size' Z3 would be joined in Sony's portfolio by the Z3 Compact, an obvious successor to the Xperia Z1 Compact that got official at the beginning of the year. This info came alongside a couple of leaked images said to depict the two upcoming devices. The Z3 duo may in fact become available shortly after their unveiling, before the end of September. That is if the leaked image above is to be believed. 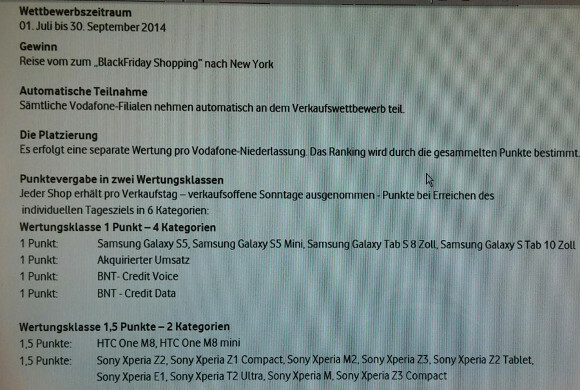 This is purported to come from an internal system at Vodafone Germany, and it seems to detail a competition for the carrier's stores. The important thing to note is that this competition ends on September 30, yet both the Xperia Z3 and the Xperia Z3 Compact are listed as devices that can bring points in the contest. It thus stands to reason that Vodafone's German arm expects to have both on sale on the last day of September at the latest. So if Sony announces the two handsets at IFA (which takes place in Berlin between September 5 and September 10), this means it may have them in stores within three weeks or so after that. In this case, the Z3 and Z3 Compact would get a much faster release than the Xperia Z2, which was unveiled in February at MWC but only started selling in April. Of course, there's another option to consider, if the document above is actually real, and not someone's wishful thinking put into writing. Sony may in fact unveil the Xperia Z3 and Z3 Compact at some point before IFA - since Vodafone's promo has started on July 1.
if z3 compact is anything like my actual z1 compact ill upgrade definitively.